Vampire Mountain (book) - Darren Shan Wiki - The wiki about all Darren Shan books! Vampire Mountain is the fourth book in The Saga of Darren Shan and the first in the Vampire Rites Trilogy. 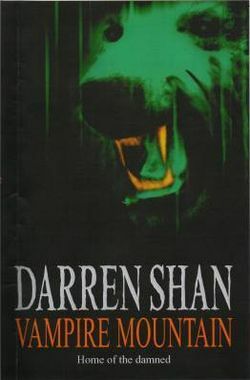 Darren Shan, along with Mr. Crepsley, leave The Cirque Du Freak and head toward the Vampire Mountain to present Darren to the Vampire Princes. The gathering at Vampire Mountain by the vampire clan is an event that occurs every 12 years. Before they leave, Mr. Tiny talks to Mr. Crepsley and coerces him into taking two of the Little People along as guardians of Darren. On the journey, Darren Shan, two of the Little People (including Harkat Mulds, once known as Lefty), and Mr. Crepsley meet Crepsley's old friend, Gavner Purl (a Vampire General introduced in the previous book) in a way station. The way station is a place where vampires rest while ascending the treacherous mountain, where Darren and Mr. Crepsley see two broken coffins and vampire blood. Here Gavner Purl jokingly tries to kidnap Darren in the way station and surprise the party. Mr. Crepsley, alert and unknowing of the man's identity nearly kills Gavner. Darren also has a fight with a bear infected with Vampaneze blood and encounters a pack of wolves (cousins of the vampires) who help him in the battle. Harkat comes and saves him and begins to speak, saying that he has a message about The Vampaneze Lord. After a long and difficult journey, the vampires and half-vampire Darren finally arrive at Vampire Mountain. There Darren first encounters Arra Sails, Mr. Crepsley's former mate, one-eyed Vanez Blane, a fighting coach for Vampire Generals. Seba Nile, Mr Crepsley's old friend,mentor and quarter master of vampire mountain, and good natured Kurda Smahlt, the soon-to-be Vampire Prince. At the mountain the vampire Princes decided that Darren has to take a series of trials that prove him worthy of being a half- vampire. The price of failure is death, either by dying during a trial, or being painfully executed by being dropped into a pit of stakes. This page was last edited on 26 September 2012, at 13:30.